The new Bentley Bentayga will be the world’s fastest SUV with top speed of at least 187mph when it goes on sale later this year, judging from the latest teaser video released ahead of the car’s debut at the forthcoming Frankfurt motor show. The Bentayga undergoing high-speed testing at a banked circuit, and includes a close-up on the digital speed display showing 301km/h. That would give the car a top speed of at least 187mph – making it comfortably faster than the Porsche Cayenne Turbo S and the Range Rover Sport SVR. You can watch the video below. Bentley is also preparing an even faster version of the Bentayga, judging by the latest spy pictures of a more extreme version of the company’s first SUV. 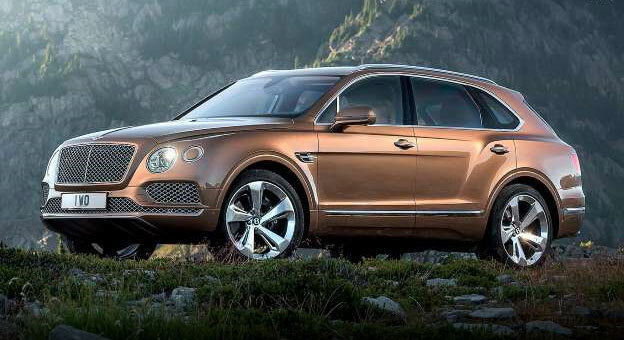 We’ve already seen lots of spy shots and ‘leaked’ official testing pictures of the Bentayga. But now a new version of the car has been caught on camera. It features a different front bumper incorporating larger air intakes and a lower air splitter, plus a small spoiler mounted at the top of the hatchback and more aggressive side skirts. Our photographers also reported that the car sounded considerably more aggressive than other test mules – a sign that it features a more sporty exhaust set-up. Bentley has already released an earlier teaser video for the Bentayga, ahead of the car’s public debut. The footage was shot during high-altitude off-road testing in Spain. It shows the car undergoing low-speed manoeuvres on rocky terrain – although the test mule does not appear to have shed any of the mild disguise that remained in recent spy shots. This entry was posted in News on September 10, 2015 by daniel.